Two important classifications of weathering processes exist – physical and chemical weathering; each sometimes involves a biological component. Mechanical or physical weathering involves the breakdown of rocks and soils through direct contact with atmospheric conditions, such as heat, water, ice and pressure. The second classification, chemical weathering, involves the direct effect of atmospheric chemicals or biologically produced chemicals also known as biological weathering in the breakdown of rocks, soils and minerals. While physical weathering is accentuated in very cold or very dry environments, chemical reactions are most intense where the climate is wet and hot. However, both types of weathering occur together, and each tends to accelerate the other. For example, physical abrasion (rubbing together) decreases the size of particles and therefore increases their surface area, making them more susceptible to chemical reactions. The various agents act in concert to convert primary minerals (feldspars and micas) to secondary minerals (clays and carbonates) and release plant nutrient elements in soluble forms. Thermal stress weathering, sometimes called insolation weathering, results from the expansion and contraction of rock, caused by temperature changes. For example, heating of rocks by sunlight or fires can cause expansion of their constituent minerals. As some minerals expand more than others, temperature changes set up differential stresses that eventually cause the rock to crack apart. Because the outer surface of a rock is often warmer or colder than the more protected inner portions, some rocks may weather by exfoliation – the peeling away of outer layers. This process may be sharply accelerated if ice forms in the surface cracks. When water freezes, it expands with a force of about 1465 Mg/m^2, disintegrating huge rock masses and dislodging mineral grains from smaller fragments. Thermal stress weathering comprises two main types, thermal shock and thermal fatigue. 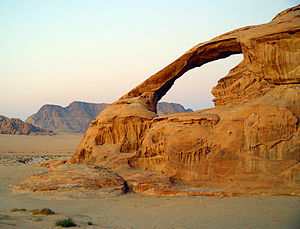 Thermal stress weathering is an important mechanism in deserts, where there is a large diurnal temperature range, hot in the day and cold at night. The repeated heating and cooling exerts stress on the outer layers of rocks, which can cause their outer layers to peel off in thin sheets. The process of peeling off is also called exfoliation. Although temperature changes are the principal driver, moisture can enhance thermal expansion in rock. Forest fires and range fires are also known to cause significant weathering of rocks and boulders exposed along the ground surface. Intense localized heat can rapidly expand a boulder. Frost weathering, also called ice wedging or cryofracturing, is the collective name for several processes where ice is present. These processes include frost shattering, frost-wedging and freeze–thaw weathering. Severe frost shattering produces huge piles of rock fragments called scree which may be located at the foot of mountain areas or along slopes. Frost weathering is common in mountain areas where the temperature is around the freezing point of water. Certain frost-susceptible soils expand or heave upon freezing as a result of water migrating via capillary action to grow ice lenses near the freezing front. 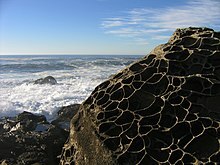 This same phenomenon occurs within pore spaces of rocks. The ice accumulations grow larger as they attract liquid water from the surrounding pores. The ice crystal growth weakens the rocks which, in time, break up. It is caused by the approximately 10% (9.87) expansion of ice when water freezes, which can place considerable stress on anything containing the water as it freezes. The process of mountain block uplift is important in exposing new rock strata to the atmosphere and moisture, enabling important chemical weathering to occur; significant release occurs of Ca2+ and other ions into surface waters. A number of plants and animals may create chemical weathering through release of acidic compounds, i.e. the effect of moss growing on roofs is classed as weathering. Mineral weathering can also be initiated or accelerated by soil microorganisms. 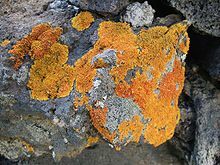 Lichens on rocks are thought to increase chemical weathering rates. For example, an experimental study on hornblende granite in New Jersey, USA, demonstrated a 3x – 4x increase in weathering rate under lichen covered surfaces compared to recently exposed bare rock surfaces. The most common forms of biological weathering are the release of chelating compounds (i.e. organic acids, siderophores) and of acidifying molecules (i.e. protons, organic acids) by plants so as to break down aluminium and iron containing compounds in the soils beneath them. Decaying remains of dead plants in soil may form organic acids which, when dissolved in water, cause chemical weathering. Extreme release of chelating compounds can easily affect surrounding rocks and soils, and may lead to podsolisation of soils. The symbiotic mycorrhizal fungi associated with tree root systems can release inorganic nutrients from minerals such as apatite or biotite and transfer these nutrients to the trees, thus contributing to tree nutrition. It was also recently evidenced that bacterial communities can impact mineral stability leading to the release of inorganic nutrients. To date a large range of bacterial strains or communities from diverse genera have been reported to be able to colonize mineral surfaces or to weather minerals, and for some of them a plant growth promoting effect was demonstrated. The demonstrated or hypothesised mechanisms used by bacteria to weather minerals include several oxidoreduction and dissolution reactions as well as the production of weathering agents, such as protons, organic acids and chelating molecules. Wikimedia Commons has media related to Weathering. ^ Paradise, T. R. (2005). "Petra revisited: An examination of sandstone weathering research in Petra, Jordan". Special Paper 390: Stone Decay in the Architectural Environment. 390. pp. 39–49. doi:10.1130/0-8137-2390-6.39. ISBN 0-8137-2390-6. ^ Taber, Stephen (1930). "The mechanics of frost heaving" (PDF). Journal of Geology. 38 (4): 303–315. Bibcode:1930JG.....38..303T. doi:10.1086/623720. ^ Goudie, A.S.; Viles H. (2008). "5: Weathering Processes and Forms". In Burt T.P. ; Chorley R.J.; Brunsden D.; Cox N.J.; Goudie A.S. (eds.). Quaternary and Recent Processes and Forms. Landforms or the Development of Gemorphology. 4. Geological Society. pp. 129–164. ISBN 1-86239-249-8. ^ Zambell, C.B. ; Adams, J.M. ; Gorring, M.L. ; Schwartzman, D.W. (2012). "Effect of lichen colonization on chemical weathering of hornblende granite as estimated by aqueous elemental flux". Chemical Geology. 291: 166–174. Bibcode:2012ChGeo.291..166Z. doi:10.1016/j.chemgeo.2011.10.009. ^ Chapin III, F. Stuart; Pamela A. Matson; Harold A. Mooney (2002). Principles of terrestrial ecosystem ecology ([Nachdr.] ed.). New York: Springer. pp. 54–55. ISBN 9780387954431. ^ Waugh, David (2000). Geography : an integrated approach (3rd ed.). Gloucester, U.K.: Nelson Thornes. p. 272. ISBN 9780174447061. ^ Landeweert, R.; Hoffland, E.; Finlay, R.D. ; Kuyper, T.W. ; van Breemen, N. (2001). "Linking plants to rocks: Ectomycorrhizal fungi mobilize nutrients from minerals". Trends in Ecology & Evolution. 16 (5): 248–254. doi:10.1016/S0169-5347(01)02122-X. PMID 11301154. ^ Calvaruso, C.; Turpault, M.-P.; Frey-Klett, P. (2006). "Root-Associated Bacteria Contribute to Mineral Weathering and to Mineral Nutrition in Trees: A Budgeting Analysis". Applied and Environmental Microbiology. 72 (2): 1258–66. doi:10.1128/AEM.72.2.1258-1266.2006. PMC 1392890. PMID 16461674. ^ Uroz, S.; Calvaruso, C.; Turpault, M.-P.; Frey-Klett, P. (2009). "Mineral weathering by bacteria: ecology, actors and mechanisms". Trends Microbiol. 17 (8): 378–87. doi:10.1016/j.tim.2009.05.004. PMID 19660952.